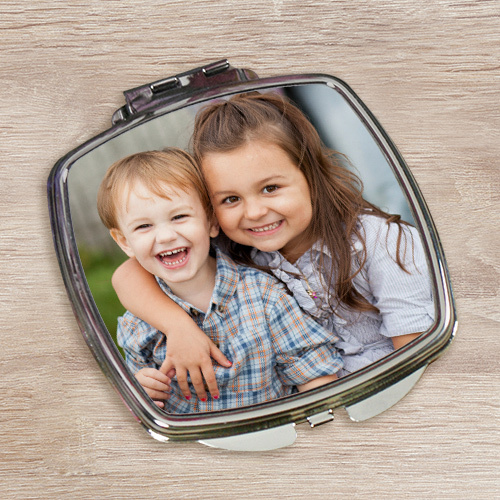 Your wonderful children, favorite pet or beautiful anniversary picture will always be there with you when you carry along this uniquely Personalized Digital Photo Compact Mirror. A wonderful personalized keepsake that will fill your heart with love while it helps make sure your are looking your very best. Your Picture Perfect Compact Mirror measures 2.5" x 3". Includes FREE Personalization. Upload your favorite digital photo below. Please don't send photos in the mail, digital photos only. Personalize your Digital Photo Compact Mirror with your digital photo. Recommended pixel resolution (dpi) is at least 500 x 500. It looked wonderful! I bought for a gift and the recipient loved it! The compact mirror was nice and with the picture it was much more than I could have imagined. I gave it to my daughter for Christmas (picture of baby and baby daddy) she just loved it. GiftsForYouNow.com has many additional Personalized Mother's Day Keepsakes for your special gift giving needs. We create beautiful Unique Mothers Day Gifts your Mom, Grandma, Aunt, Sister or Best Friend will absolutely love. Think outside the box with unique, Personalized Gifts from GiftsForYouNow.com.